Several historical artifacts exhibited at the Maldives National Museum, including Buddhist statues were destroyed in a mob attack on Wednesday morning, an act of vandalism that is said to have caused “unimaginable damage” to the treasured Maldivian heritage. Speaking to Minivan News, a museum official said that a group of five to six men stormed into the building twice, “deliberately targeted the Buddhist relics and ruins of monasteries exhibited in the pre- Islamic collection, destroying most items “beyond repair”. The official said that the details of the damage cannot be released as the police have asked the museum to withhold the information until the investigation into the attack is pending.”‘But I can say that attackers have done unimaginable damage,” he added. “This is not like a glass we use at home that can be replaced by buying a new one from a shop. These are originals from our ancestors’ time. These cannot be replaced ever again,” the official exclaimed. 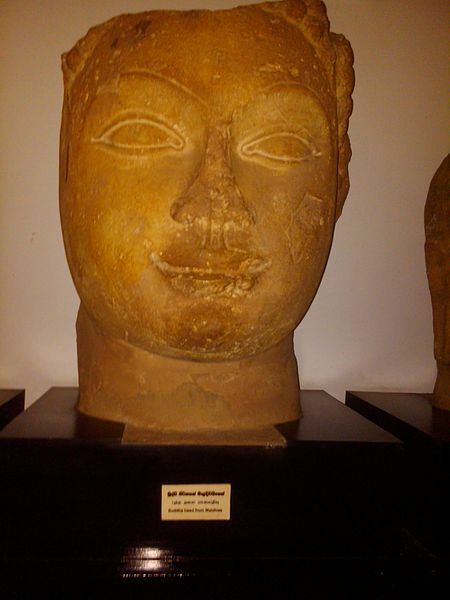 According to a source, a coral stone head of Lord Buddha, an 11th century piece recovered from Thoddoo in Alifu Atoll, was smashed up by the attackers, one of the most significant pieces at the museum inside Sultan’s Park. The museum was built with Chinese government aid and opened on July 26, 2010. Other pieces vandalised include the Bohomala sculptures, monkey statues and a broken statue piece of the Hindu water god, Makara, while the two five faced statues discovered from Male’ were also damaged – the only remaining archaeological evidence proving the existence of a Buddhist era in the Maldives. The glass casings holding the items were also destroyed in the attack. According to the museum official, some of the attackers who returned to the museum for the second time were apprehended by the police who arrived on the scene. “Around five to six people were taken under police custody. But by then they had already done the damage they wanted,” he observed. Minivan News could get the confirmation on the arrest from the police at the time of press. The attack on the museum coincided with the political unrest that escalated in Male’ on late hours of Tuesday night, after a group of policeman and military allegedly joined the opposition protestors, forcing Former President Mohamed Nasheed to resign the following day. AFP reported Nasheed as saying that the vandals included Islamist hardliners who had attacked the museum because they believed some of the statues inside were “idolatrous”. The monuments gifted by the South Asian countries to the Maldives ahead of the 17th summit of South Asian Association of Regional Cooperation SAARC, hosted in Addu city were also denounced as idolatrous monuments and vandalised, including the monument gifted by Pakistan. Removal of the contentious monuments was one of the five demands of the December 23 protesters, including religious groups and opposition, who also demanded that the government prohibit Israeli airlines from operating in the Maldives. The museum official who spoke to Minivan News earlier said that he cannot comment on whether the attack was connected to fundamentalists.